Lincoln was born on February 12, 1809, in a one-room log cabin in Hardin County, Kentucky; his family moved to southern Indiana in 1816. Lincoln’s formal schooling was limited to three brief periods in local schools, as he had to work constantly to support his family. In 1830, his family moved to Macon County in southern Illinois, and Lincoln got a job working on a river flatboat hauling freight down the Mississippi River to New Orleans. After settling in the town of New Salem, Illinois, where he worked as a shopkeeper and a postmaster, Lincoln became involved in local politics as a supporter of the Whig Party, winning election to the Illinois state legislature in 1834. Like his Whig heroes Henry Clay and Daniel Webster, Lincoln opposed the spread of slavery to the territories, and had a grand vision of the expanding United States, with a focus on commerce and cities rather than agriculture. Did you know? The war years were difficult for Abraham Lincoln and his family. After his young son Willie died of typhoid fever in 1862, the emotionally fragile Mary Lincoln, widely unpopular for her frivolity and spendthrift ways, held seances in the White House in the hopes of communicating with him, earning her even more derision. Lincoln taught himself law, passing the bar examination in 1836. The following year, he moved to the newly named state capital of Springfield. For the next few years, he worked there as a lawyer, earning a reputation as “Honest Abe” and serving clients ranging from individual residents of small towns to national railroad lines. He met Mary Todd, a well-to-do Kentucky belle with many suitors (including Lincoln’s future political rival, Stephen Douglas), and they married in 1842. Lincoln won election to the U.S. House of Representatives in 1846 and began serving his term the following year. As a congressman, Lincoln was unpopular with many Illinois voters for his strong stance against the U.S. war with Mexico. Promising not to seek reelection, he returned to Springfield in 1849. Events conspired to push him back into national politics, however: Douglas, a leading Democrat in Congress, had pushed through the passage of the Kansas-Nebraska Act (1854), which declared that the voters of each territory, rather than the federal government, had the right to decide whether the territory should be slave or free. On October 16, 1854, Lincoln went before a large crowd in Peoria to debate the merits of the Kansas-Nebraska Act with Douglas, denouncing slavery and its extension and calling the institution a violation of the most basic tenets of the Declaration of Independence. Lincoln then squared off against Douglas in a series of famous debates; though he lost the Senate election, Lincoln’s performance made his reputation nationally. His profile rose even higher in early 1860, after he delivered another rousing speech at New York City’s Cooper Union. That May, Republicans chose Lincoln as their candidate for president, passing over Senator William H. Seward of New York and other powerful contenders in favor of the rangy Illinois lawyer with only one undistinguished congressional term under his belt. In the general election, Lincoln again faced Douglas, who represented the northern Democrats; southern Democrats had nominated John C. Breckenridge of Kentucky, while John Bell ran for the brand new Constitutional Union Party. With Breckenridge and Bell splitting the vote in the South, Lincoln won most of the North and carried the Electoral College to win the White House. After years of sectional tensions, the election of an antislavery northerner as the 16th president of the United States drove many southerners over the brink. By the time Lincoln was inaugurated as 16th U.S. president in March 1861, seven southern states had seceded from the Union and formed the Confederate States of America. After Lincoln ordered a fleet of Union ships to supply South Carolina’s Fort Sumter in April, the Confederates fired on both the fort and the Union fleet, beginning the Civil War. Hopes for a quick Union victory were dashed by defeat in the Battle of Bull Run (Manassas), and Lincoln called for 500,000 more troops as both sides prepared for a long conflict. While the Confederate leader Jefferson Davis was a West Point graduate, Mexican War hero and former secretary of war, Lincoln had only a brief and undistinguished period of service in the Black Hawk War (1832) to his credit. He surprised many when he proved to be a capable wartime leader, learning quickly about strategy and tactics in the early years of the Civil War, and about choosing the ablest commanders. General George McClellan, though beloved by his troops, continually frustrated Lincoln with his reluctance to advance, and when McClellan failed to pursue Robert E. Lee’sretreating Confederate Army in the aftermath of the Union victory at Antietam in September 1862, Lincoln removed him from command. 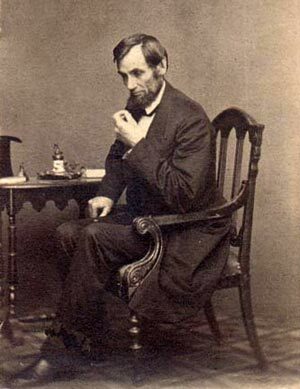 During the war, Lincoln drew criticism for suspending some civil liberties, including the right of habeas corpus, but he considered such measures necessary to win the war. Though Lincoln once maintained that his “paramount object in this struggle is to save the Union, and is not either to save or destroy slavery,” he nonetheless came to regard emancipation as one of his greatest achievements, and would argue for the passage of a constitutional amendment outlawing slavery (eventually passed as the 13th Amendment after his death in 1865). Two important Union victories in July 1863–at Vicksburg, Mississippi, and Gettysburg, Pennsylvania–finally turned the tide of the war. General George Meade missed the opportunity to deliver a final blow against Lee’s army at Gettysburg, and Lincoln would turn by early 1864 to the victor at Vicksburg, Ulysses S. Grant, as supreme commander of the Union forces. 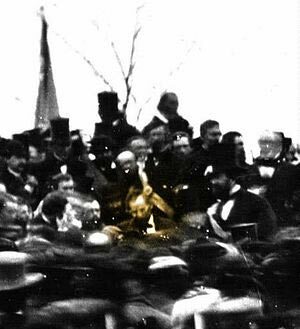 In November 1863, Lincoln delivered a brief speech (just 272 words) at the dedication ceremony for the new national cemetery at Gettysburg. Published widely, the Gettysburg Address eloquently expressed the war’s purpose, harking back to the Founding Fathers, the Declaration of Independence and the pursuit of human equality. It became the most famous speech of Lincoln’s presidency, and one of the most widely quoted speeches in history. As Sherman marched triumphantly northward through the Carolinas, Lee surrendered to Grant at Appomattox Court House, Virginia, on April 9. Union victory was near, and Lincoln gave a speech on the White House lawn on April 11, urging his audience to welcome the southern states back into the fold. Tragically, Lincoln would not live to help carry out his vision of Reconstruction. On the night of April 14, the actor and Confederate sympathizer John Wilkes Booth slipped into the president’s box at Ford’s Theatre in Washington, D.C., and shot him point-blank in the back of the head. Lincoln was carried to a boardinghouse across the street from the theater, but he never regained consciousness, and died in the early morning hours of April 15, 1865. Abraham Lincoln was born Feb 12, 1809, in a single-room log cabin, Hardin County, Kentucky. His family upbringing was modest; his parents from Virginia were neither wealthy or well known. At an early age, the young Abraham lost his mother, and his father moved away to Indiana. Abraham had to work hard splitting logs and other manual labour. But, he also had a thirst for knowledge and worked very hard to excel in his studies. 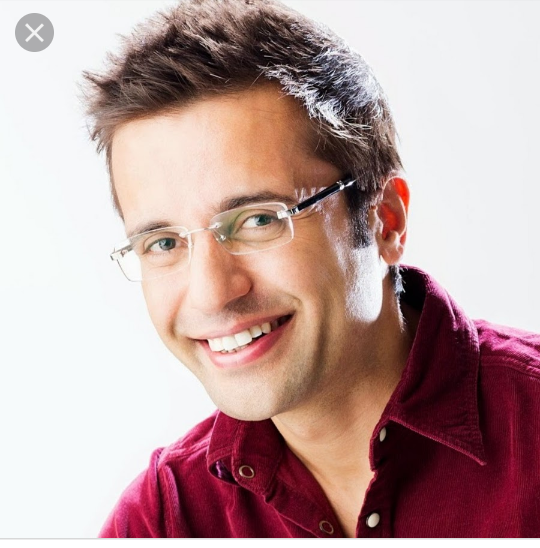 This led him to become self-trained as a lawyer. He spent eight years working on the Illinois court circuit; his ambition, drive, and capacity for hard work were evident to all around him. Lincoln became respected on the legal circuit and he gained the nickname ‘Honest Abe.’ He often encouraged neighbours to mediate their own conflicts rather than pursue full legal litigation. Lincoln also had a good sense of humour and was deprecating about his looks. Work colleagues and friends noted that Lincoln had a capacity to defuse tense and argumentative situations, though the use of humour and his capacity to take an optimistic view of human nature. He loved to tell stories to illustrate a serious point through the use of humour and parables. Lincoln was shy around women but after a difficult courtship, he married Mary Todd in 1842. Mary Todd shared many of her husband’s political thinking but they also had different temperaments – with Mary more prone to swings in her emotions. They had four children, who Lincoln was devoted to. Although three died before reaching maturity – which caused much grief to both parents. As a lawyer, Abraham developed a capacity for quick thinking and oratory. His interest in public issues encouraged him to stand for public office. In 1847, he was elected to the House of Representatives for Illinois and served from 1847-49. During his period in Congress, Lincoln criticised President Folk’s handling of the American-Mexican War, arguing Polk used patriotism and military glory to defend the unjust action of taking Mexican territory. However, Lincoln’s stance was politically unpopular and he was not re-elected. After his political career appeared to be over, he returned to working as a lawyer in Illinois. However, the 1850s saw the slavery question re-emerge as a prominent divisive national issue. Lincoln abhorred slavery and from a political perspective wished to prevent slavery being extended and ultimately be phased out. He gave influential speeches, which drew on the Declaration of Independence to prove the Founding Fathers had intended to stop the spread of slavery. In particular, Lincoln used a novel argument that although society was a long way from equality, America should aspire towards the lofty statement in the Declaration of Independence. Lincoln had a strong capacity for empathy. He would try to see problems from everyone’s point of view – including southern slaveholders. He used this concept of empathy to speak against slavery. Lincoln’s speeches were notable because they drew on both legal precedents but also easy to understand parables, which struck a chord with the public. 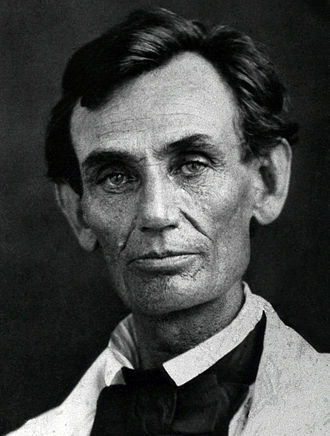 In 1858, Lincoln was nominated as Republican candidate for the Senate. He undertook a series of high-profile debates with the Democratic incumbent Stephen Douglass. Douglass was in favour of allowing the extension of slavery – if citizens voted for it. Lincoln opposed the extension of slavery. During this campaign, he gave one of his best-remembered speeches, which reflected on the divisive nature of America. In this House Divided speech, Lincoln gave a prophetic utterance to the potential for slavery to divide the nation. Although he lost this 1858 Senate election, his debating skills and oratory caused him to become well known within the Republican party. On February 27, 1860. Lincoln was also invited to give a notable address at Cooper Union in New York. The East Coast was relatively new territory for Lincoln; many in the audience thought his appearance awkward and even ugly, but his calls for moral clarity over the wrongness of slavery struck a chord with his East coast audience. The reputation he gained on the campaign trail and speeches on the East coast caused him to be put forward as a candidate for the Republican nominee for President in 1860. Lincoln was an outsider because he had much less experience than other leading candidates such as Steward, Bates and Chase, but after finishing second on the first ballot he went on to become unexpectedly nominated. The election of Lincoln as President in 1861, sparked the South to secede from the North. Southern independence sentiment had been growing for many years, and the election of a president opposed to slavery was the final straw. However, Lincoln resolutely opposed the breakaway of the South, and this led to the American civil war with Lincoln committed to preserving the Union. Lincoln surprised many by including in his cabinet the main rivals from the 1860 Republican campaign. It demonstrated Lincoln’s willingness and ability to work with people of different political and personal approaches. This helped to keep the Republican party together. The Civil War was much more costly than many people anticipated and at times Lincoln appeared to be losing the support of the general population. But, Lincoln’s patient leadership, and willingness to work with unionist Democrats held the country together. Lincoln oversaw many of the military aspects of the war and promoted the general Ulysses S Grant to command the northern forces. 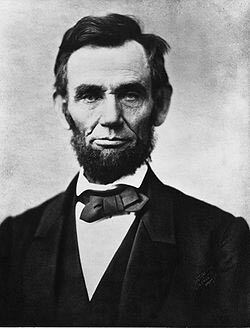 Initially, the war was primarily about the secession of southern states and the survival of the Union, but as the war progressed, Lincoln increasingly made the issue of ending slavery paramount. On September 22, 1862, Lincoln issued the Emancipation Proclamation that declared the freedom of slaves within the Confederacy. The Proclamation came into force on January 1, 1863. Towards the end of the year, many black regiments were raised to help the Union army. After a difficult opening two years, by 1863, the tide of war started to swing towards the Union forces – helped by the victory at the Battle of Gettysburg in July 1863. Lincoln felt able to redefine the goals of the civil war to include the ending of slavery. Eventually, after four years of attrition, the Federal forces secured the surrender of the defeated south. The union had been saved and the issue of slavery had been brought to a head. 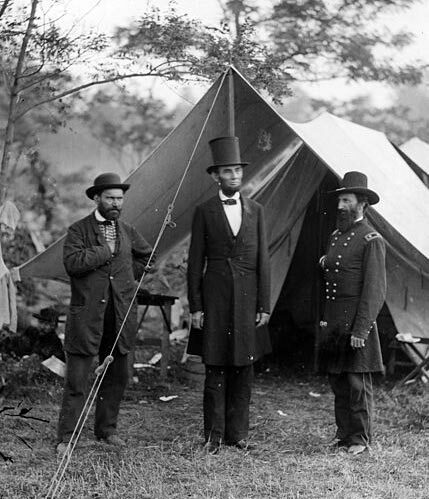 In the aftermath of the civil war, Lincoln sought to reunite the country – offering a generous settlement to the south. When asked how to deal with the southern states, Lincoln replied. “Let ’em up easy.” Lincoln was opposed by more radical factions who wanted greater activism in the south to ensure civil rights for freed slaves. On January 31, 1865, Lincoln helped pass through Congress a bill to outlaw slavery. The Thirteenth Amendment to the United States Constitution was officially signed into law on December 6, 1865. Some northern abolitionists and Republicans wanted Lincoln to go further and implement full racial equality on issues of education and voting rights. Lincoln was unwilling to do this (it was a minority political view for the time) Frederick Douglass, a leading black activist (who had escaped from slavery) didn’t always agree with the policies of Lincoln but after meeting Lincoln, he said enthusiastically of the President. Five days after the surrender of Robert E. Lee and the Confederate Army, Lincoln was assassinated by John Wilkes Booth while visiting Ford’s Theatre. Lincoln’s death was widely mourned across the country. Lincoln is widely regarded as one of America’s most influential and important presidents. As well as saving the Union and promoting Republican values, Lincoln was viewed as embodying the ideals of honesty and integrity. – Giuseppe Garibaldi, 6 August 1863.